Orla, a Nord priestess of Dibella, lives at the Temple of Dibella. There are no beds at the temple, so she never sleeps. She becomes available for marriage after The Heart of Dibella. She expresses no concern at having to marry in the Temple of Mara, even though she's a priestess of Dibella. 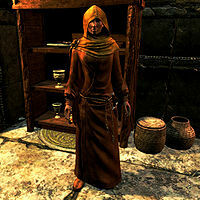 She wears hooded monk robes and a pair of boots, and is equipped with an iron dagger. She carries a key to the temple of Dibella, a key to the inner sanctum, and a selection of common loot and gold. She knows the following spells: Conjure Familiar, Frostbite, and Fast Healing. When married, Orla may remain at the Temple of Dibella even when you ask to move to another place. Because there are no beds in the temple, it is impossible to get the Lover's Comfort bonus. This page was last modified on 4 March 2015, at 17:32.